The clash of Real Madrid and Barcelona is rightly called El Clasico. The match is about culture, history, politics and yes- it is predominantly about football. The game features some of the greatest players in the world of football and the rivalry of Spain's leading clubs creates spectacular football which is remembered for a long time to come. Satellite viewers are subjected to the joust between the two teams weeks before the lead up to the game and the presence of Di Maria, Iniesta, Xavi, Benzema, Lionel Messi and Cristiano Ronaldo in one frame makes it for an intense rivalry as the two teams look to play for pride-a failure can reduce them to great embarrassments while a stunning 90 minutes is capable of elevating them to the status of a hero. 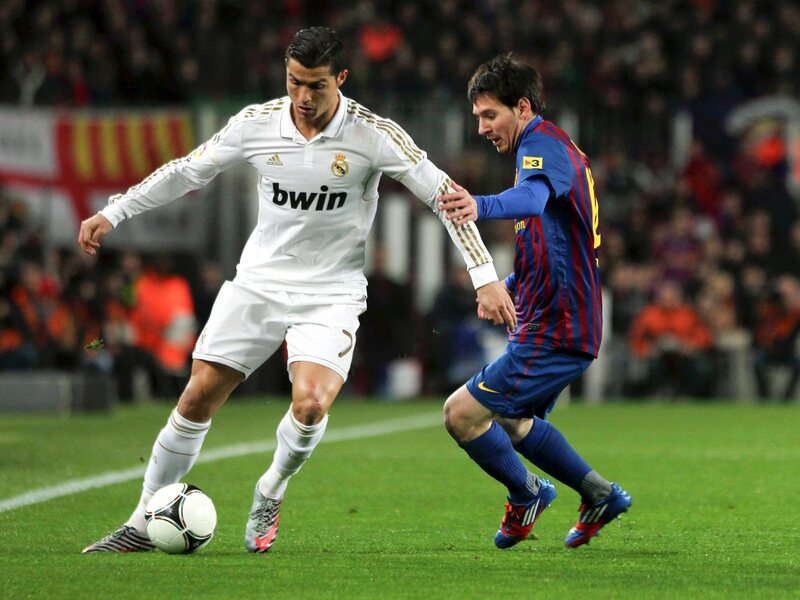 Despite the presence of many greats on both sides, there is no denying the “Messi vs Ronaldo” factor. Debates are inconclusive as to who is the “best” in the world- with both sharing the Ballon D’Or 5 times amongst them- and comparisons whenever they face off is but evident. As the two take the field, they look to emerge triumphant in this “mini battle” along with guiding their respective clubs to victory. For the loyal fans, a loss in this marquee clash is unacceptable - the pressure then on the two players is immense. How do they fare against each other? The Argentine has played Real 27 times since making his debut for the club in 2007- twice in the Champions League, 15 times in La Liga, on 6 occasions in the Copa Del Rey and 4 times in the Spanish Super Copa. The Portuguese on the other hand has faced them on 21 occasions- twice in the Champions league (not including the 3 times he played them in the Manchester United colours), 9 times in the league, 6 times in the Copa Del Rey and has had 4 meetings with them in the Super Copa. Purely based on stats, the Barcelona forward is ahead with 21 goals as against Ronaldo's 13. With 17 assists the left footed player has had a hand in more goals for his team as compared to his rival's 2 assists. The 2013 FIFA Ballon D'Or winner scored 9 goals in his last 10 El Clasicos, scoring in a record 6 consecutive derbies till March last year. Messi who had scored only 5 in his last ten games was outshined by Ronaldo earlier in the year after the latter snatched the FIFA best player award from him after four years. With talks of his dying skills, the wizard answered his critics by scoring a hattrick against the Los Blancos in March this year. On an average, Messi scores an El Clasico goal every 130.5 minutes while it takes Ronaldo 145.6 minutes to score for Real. Overall, Messi has a higher winning percentage (44%) compared to the former United players percentage of 26. Messi’s good vs Ronaldo’s evil, the humility of the Argentine and the natural arrogance of the Portuguese makes it a clash worth remembering every time the two clubs face off. Here is a look at the top 3 performances of the two stars in El Clasico encounters which won't be forgotten in a long time. Lionel Messi has shown his skills In Spain on a number of occasions since 2007 and has given some outstanding performances. 1. La Liga 2007 (Barcelona 3-3 Madrid) Messi opened his El Clásico account in spectacular fashion with a hat-trick against Real at Camp Nou. He latched onto a Samuel Eto’o pass and then lashed home another from close range. Messi’s third equalizer came in the 88th minute when he showed great composure to control a Ronaldinho pass, outpace the Madrid defense and fire across Casillas into the corner. ?2. Champions League 2011 (Real Madrid 0-2 Barcelona) Two second-half goals in the semi-final first-leg at the Bernabeu effectively put the tie beyond Real at the halfway stage. Ibrahim Afellay set up Messi for a close range finish and the Argentine added a second when he left the Madrid defenders trailing before finishing past Casillas. A sublime individual goal. 3. Super Cup 2012 (Real Madrid 2-1 Barcelona) Jose Mourinho’s side stunned Barca with two goals in the first 20 minutes from Gonzalo Higuain and Cristiano Ronaldo. However, Messi hit back with a free-kick before half-time. He curled the ball beyond the outstretched hands of Casillas to level the match on aggregate. It was one of Messi’s best free-kicks although not enough to bring home the Super Cup as Madrid won on away goals.